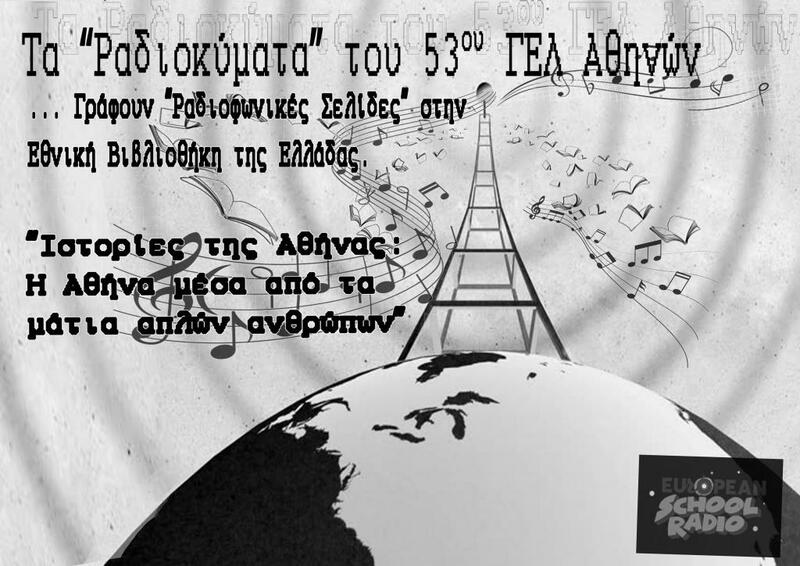 The RadioWaves of the 53rd GEL of Athens write the first of the “Radio Pages” of the European School Radio in the National Library of Greece with the show “Athens Stories: Athens through the eyes of ordinary people”. The school’s radio team presents a survey of the history of modern Athenians and brings to the forefront the hidden, daily, older and more recent stories of internal and external migration, utilizing oral testimonies and other material. The show features extracts from the interviews that students took and of course many songs about Athens. The group consists of the students Aligeorga Alexia, Ameridis Angelos, Apostolopoulou Dimitra, Vasiliou Vasilis, Georgali Nikoleta, Gagalis Alexandros, Zacharopoulos Serafim, Zelmanovich Alexandros, Machaira Marina, Markou Daniela, Papadaki Nefeli, Trpseveska Christina. Teachers: Angelos Vazaios, Kyriaki Kefallinou, Anna Trypospoufi.